We supply quality furniture and accessories for varied Landlords furnishing requirements including serviced accommodation, homes of multiple occupation, holiday homes, student furniture and general rented accommodation. Furnishing and dressing services, bespoke design and selection from a large inventory to suit the accommodation type and purpose. All items are delivered to the property, fully assembled and installed to each room, packaging is removed and recycled responsibly. 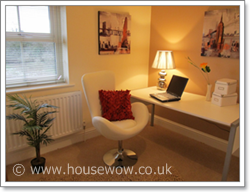 The accommodation is left styled, dressed and dusted down ready for tenants or marketing photography. Beds, sofas and soft furnishings are hotel quality, furniture is durable and fit for purpose. Double beds, king size, singles or zip and link beds can be supplied. All items in accordance with landlord and fire and safety regulations. Kitchen packs, electronic items, TV's, white goods. Items can be supplied in a wide range of styles and quality to suit need rather than a one size-fits-all approach. Accessories may include Art work, full bedding, cushions, throws, lamps, rugs, style accessories, curtains and blinds. Whether you require a simple furniture pack or luxury furniture with full styling to suit the most discerning tastes House Wow stylists will style accordingly. Full range of quality furniture and furnishings are supplied, installed and left ready to view. (*)HMO Government define HMO, Houses of multiple occupation as: Both of the following apply: at least 3 tenants live there, forming more than 1 household. Tenants share toilet, bathroom or kitchen facilities with other tenants. Bespoke designs suited to the varied holiday accommodation our clients have. Quality products, service and installation come as standard. Whatever your accommodation type or size from bijou city apartment to large detached family home in the suburbs we can style, supply and install the most appropriate quality furnishings and accessories.